Faith, Hope and Art: I hate Extra Credit! As I begin my 18th year teaching, I am more determined than ever to take some of the "extra stuff" that I do on a daily basis OFF my load. These "extras" are time killers, energy wasters and just down right frustrating!! One of these things that bugs me the most is Extra Credit! I really, really want to say, JUST DO THE ASSIGNMENT IN THE FIRST PLACE!! But I don't. I don't because sometimes there are extenuating circumstances. Sometimes the students are just lazy and forgetful. But sometimes, so am I. So, I offer extra credit. Which means more grading for me. This year, I am taking a page out of the Love and Logic mindset and saying that "fixing your problem should not cause more work for me!" Therefore, extra credit is going to benefit us both. If a student wants to earn extra credit, GREAT!! 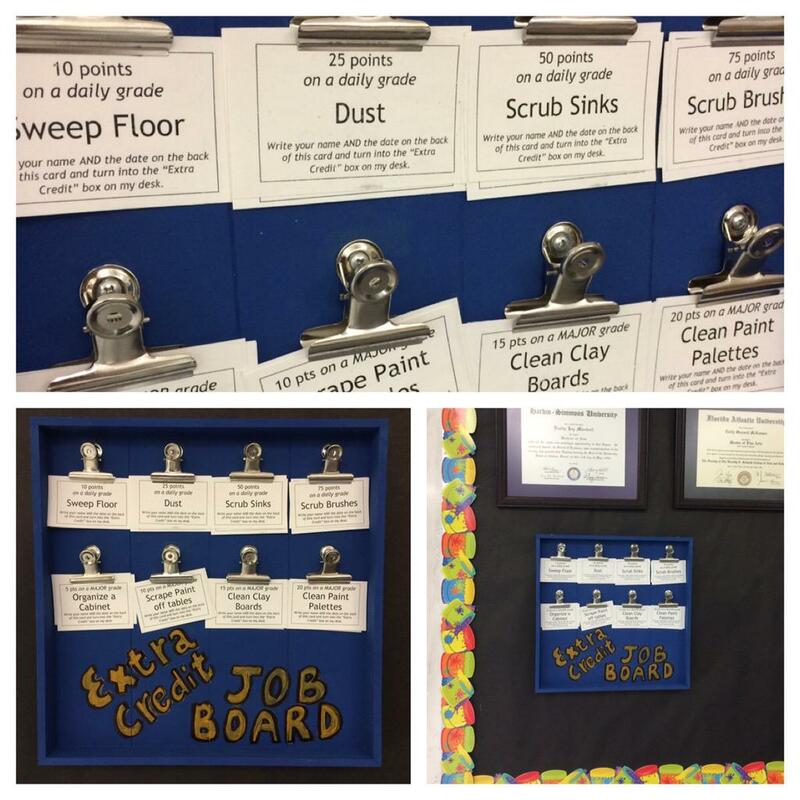 All the student has to do is go to my "Extra Credit Job Board" and pick a job that goes with the number of points the student wants to earn. That's the point. Extra credit should be extra WORK for the STUDENT! Not the teacher or the parent! So why did I choose the jobs that included this time? Cause these are jobs that I end up doing day after day! That's why. I know that students (and parents too) will complain that I'm not giving traditional assignments as extra credit, but I'm tried of making more work for myself when there are jobs that desperately need doing. And should my room be too clean and too organized? Well, that would be a change! :) And I can always change out the jobs as they are completed should for some reason my sinks are clean! So I have to say, I'm excited about "giving" extra credit this year!! I wonder how many students will take advantage of my kind offer?